this is south Indian style of Pudhina rice. Wash and soak the rice in water for 30 minutes. Heat the vessel add the ghee and oil then add the cinnamon stick, cloves and Cardamom. After the spice spluttered add the sliced onion, fry it until became trasnparent, Now add the grinded paste and green peas fry untill the raw smells goes, now you will feel the aroma of the fried masala then add 2 cups water and bring to boil, finally add the rice, put on medium flame. 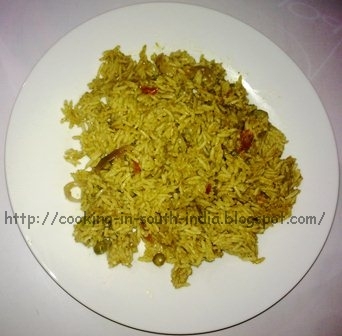 Delicious pudhina pulao is ready. Hummus is a popular, delicious and healthy Arabic dish. Soak the chickpeas in water for overnight then rinse and boil it well until done. In the food processor add the cooked chick peas along with the above Ingredients blend it well like a smooth paste. Transfer it to the serving bowl. Drizzle some amount of olive oil and Sprinkle Sumak powder or Finely chopped parsley or paprika with some olives in the center. serve with Arabic bread or Peta Bread.